We don't send live environment access on Fridays. The test environment will remain available throughout the duration of the contract. These are fake fees, paid with fake money. 3D Secure authentication : leave the default selected option in order to make a successful authentication. Date : une date dans le futur. Use your own user ID for testing. Payments will not be charged on your bank account. Date: any date in the future. "adminmb" login, with default "adminmb" password (that you should change). With this account you get full access on both DIRECTKIT and BACKOFFICE. You can also create more accounts if needed for your business. The specific technical account "SC", which stands for "SOCIETY", is used to collect your fees. It is also used by LEMON WAY to collect our fees. Please be aware this account's balance can only be positive, as any payment account in our system. This means, if this technical accout does not have enough money to pay LEMON WAY fees, your payments will not be processed and an error will be returned from our API. 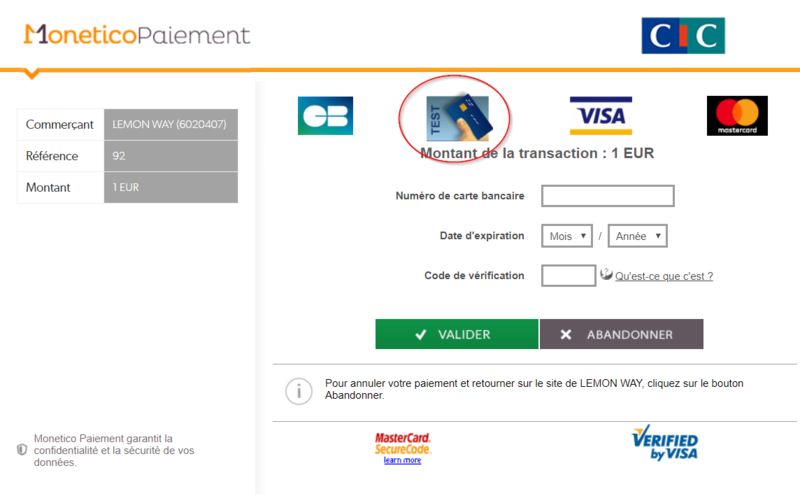 You can credit this technical account using your company's Visa ou Mastercard card, call the MoneyIn method in order to do so, or you can also do a fund transfer to our LEMON WAY bank account, with a specific description on the fund transfer.